The Calico Cat: What can I say about red? Sounds like a good time. Isn't it fun to actually meet the people we talk to online?! A while back on the nickle group I did a red and white swap. It becomes a serious passion. 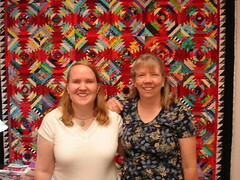 Yes, it's a very red quilt...I love it! Sounds like you two had fun. So nice to see two blogging friends together and having a good time! That would be great, to meet some bloggers...so much in common to start! hurray for meeting a fellow blogger! How nice that you got to meet up with a fellow blogger! Sounds like a wonderful day.